Two coordinators share the task of supervising each Study Center. The coordinators’ primary focus is to provide all encompassing academic support and mentor the students on study skills for all subjects while maintaining a safe and productive learning environment. AmeriCorps Members serving with the Portland Housing Authority Implement programming in & out of the Study Center to engage students in academics. They provide one-on-one support to students and their families to get them to attend, engage, and invest in their academic future. AmeriCorps members also strengthen our program by implementing best practices in Volunteer Management. Emily Mancini-Fitch is the Resident Services Manager of the Portland Housing Authority. Formerly a two-term AmeriCorps State and National member at the Portland Housing Authority Sagamore Village Education Center and Riverton Park Study Center Coordinator, She has worked with many organizations to create and expand educational programming for students of all ages residing in and around PHA Public Housing. She has reached out to strengthen the bond between the PHA and the University of Southern Maine, The NAACP, and many other organizations which has allowed them to provide opportunities to hundreds of Portland Housing Authority children and families. Emily also manages the PHA Scholarship program, the CHEETA Project, the free summer meals program, the summer soccer program, the neighborhood service providers, community buildings, and all of the volunteers associated with the programs. 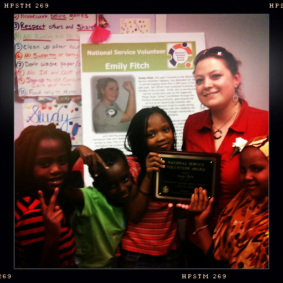 Emily Was recognized for her service and volunteerism at the 2010 Governor’s Service awards with the National Service Volunteer Award for accomplishments during her AmeriCorps terms of service with the GoodWill AmeriCorps Community Resource Corps. Emily loves volunteering and education and plans to continue serving her communities through non-profits, the PHA and whatever future endeavors she takes on.